Los Angeles. 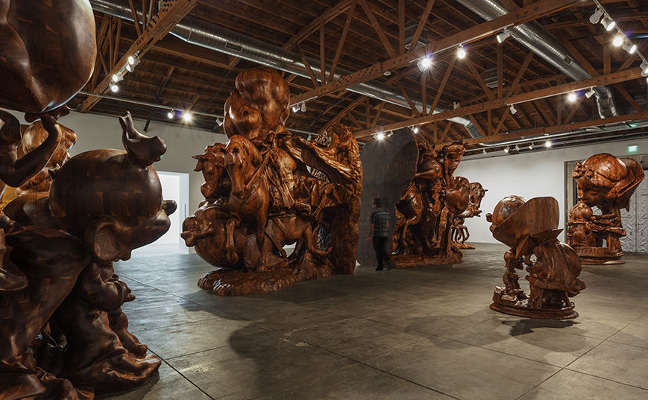 Hauser & Wirth is pleased to announce ‘Paul McCarthy. 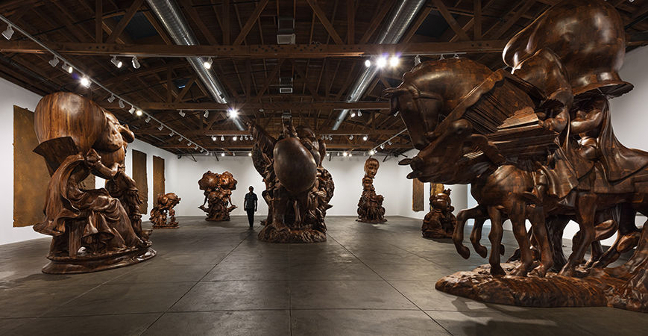 WS Spinoffs, Wood Statues, Brown Rothkos,’ the gallery’s first exhibition in Los Angeles devoted to the provocative and influential work of acclaimed LA-based artist Paul McCarthy. Opening 1 July, this exhibition presents ‘spinoffs’ from White Snow, a major ongoing project within the artist’s multidisciplinary practice that subverts the beloved 19th century German folktale ‘Schneewittchen’ (Snow White) and the modern interpretation of that story in Disney’s 1937 animated classic ‘Snow White and the Seven Dwarfs.’ Never before exhibited in Los Angeles, the works on view – nine monumental carved black walnut sculptures of Snow White, the Prince, and Dopey, alongside arresting wall hangings – seek to disrupt traditional notions of art and culture, while introducing viewers to McCarthy’s tireless exploration of mediums. Over the past 50 years, Paul McCarthy has committed his practice to performance, photography, painting, sculpture, film, and installation, to ‘propos[e] that reality itself can fluctuate.’ His protean oeuvre has stirred lively debate, raising critical questions about accepted norms. Connecting seemingly disparate bodies of work through humor, derision, and art historical parallels, McCarthy undermines America’s projected normalcy, pitting archetypal narratives against the messier realities of human drives and desires. Family systems, along with mass media and its effects on the development of children, are at the center of a sprawling practice that focuses on smashing society’s double standards and hypocrisies. The theme of Snow White first appeared publicly in McCarthy’s work in 2009, with an exhibition of ‘White Snow’ drawings that became the basis for a group of sculptures presented in his 2011 exhibition ‘The Dwarves, The Forest’ at Hauser & Wirth New York. This landmark exhibition featured a series of black bronze dwarves, sculpted from earlier drawings, an important starting point in the exploration of the artist’s White Snow project. 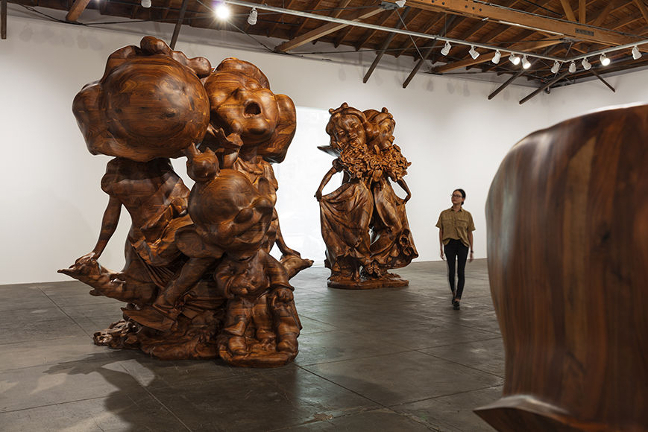 In his new exhibition at Hauser & Wirth Los Angeles, Snow White and her cohorts are transmuted through a process that begins with commercially produced, collectible Disney figurines – totems of unstintingly perfect proportions. Through McCarthy’s laborious, performative approach, those ‘tchotchkes’ are freed from their original predetermined ratios, as if released from societal repression and infantilization. 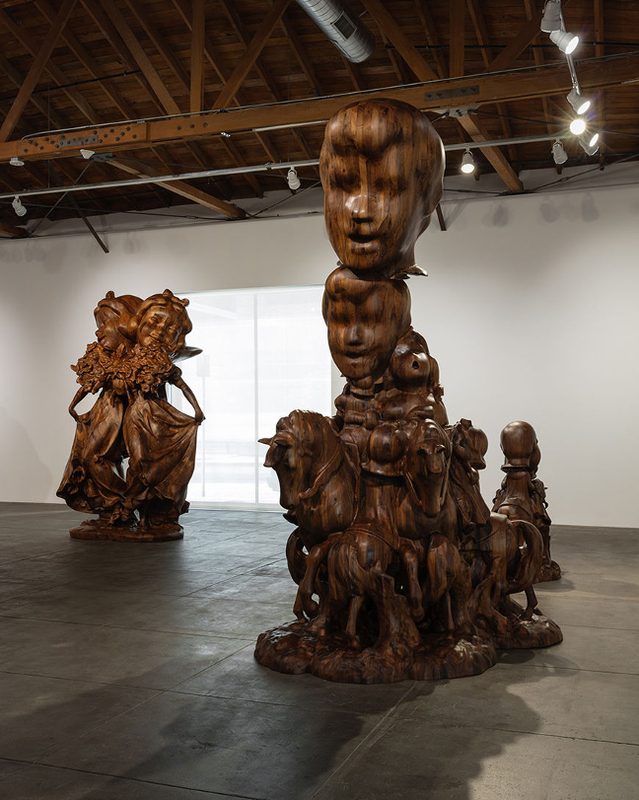 With their gaping mouths, twisting necks, and multiplying heads, the twelve sculptures on view harken to the dynamism of classical Baroque sculpture and pay tribute to the history of classicism. To create the massive works on view, McCarthy took to the computer, employing digital mapping and combining to explore possibilities of scale, variation, repetition, and merging. To realize these works, small pieces of black walnut were assembled into massive blocks, then precisely machine-cut and hand-sanded. Variations in grain allow for impressive grid-like patterning that reveals the remarkable marquetry of each colossal sculpture. Utilizing his staged process of producing ‘abstracts through merging,’ McCarthy crossbreeds beloved cultural characters to restructure reality. ‘White Snow, Bookends’ (2013), the largest work in the exhibition, which weighs a total of 36,000 pounds, is a two-part sculpture depicting the Prince and White Snow on horseback. His eyes are closed and her mouth falls open in seemingly arrested pleasure or pain. 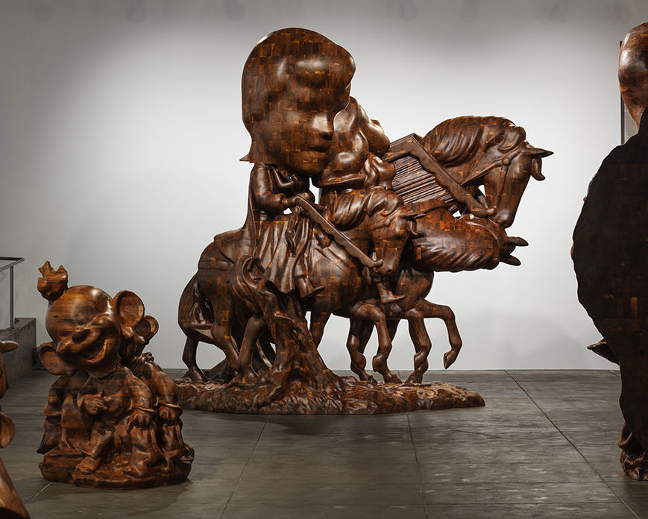 ‘WS, White Snow and Prince on Horseback, Merger, Transformation, Mutation’ (2015), amalgamates the subjects’ appendages into a hyperbolic composite: the three horses gallop on 12 legs, White Snow shrieks from two visible mouths, and the Prince’s head is larger than that of his surging stallion. With ‘WS, White Snow Dopey Dopey Head, Ten Feet’ (2013 – 2014), White Snow’s lips, grotesquely enlarged, swallow the head of a duplicated dwarf. Here, McCarthy has become the producer of a parallel Hollywood, employing tactics of the film industry to recast adored icons in deviant roles. Behind the endearing, prepackaged Disney façade that dictates the American surface lurk wild, untamed urges that McCarthy unleashes with deftness and humor.